People juice for a number of different reasons -- to increase their fruit and veggie intake, alleviate various ailments or to use as a detox. When it comes to weight gain, you might not think of juicing as an option. But juice is a concentrated source of calories, and can help you gain if it increases your overall caloric intake. However, juice is a concentrated source of sugar and has negligible protein, so it should not be your only means of helping you gain weight. Consult your doctor before making changes to your diet. Gaining weight requires you to eat more calories than you expend. While weight-gain calorie needs vary from person to person, adding 500 calories to your daily intake should help you gain 1 pound a week. To gain weight healthfully, you want those extra calories to come from healthy foods. Fruits and vegetables are nutrient dense, but not necessarily high in calories. 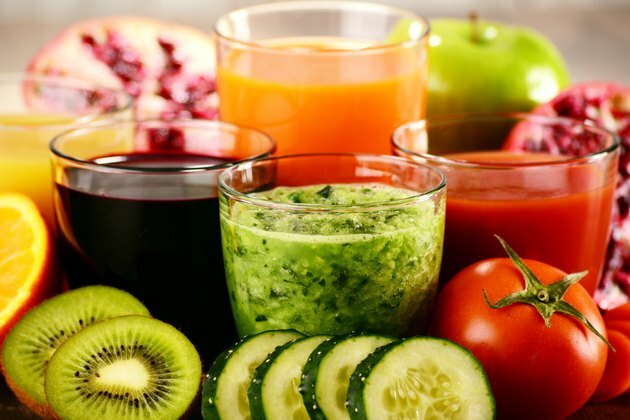 However, juicing fruits and vegetables concentrates the calories, and creates a high-calorie drink that may help you in your weight-gain efforts. Registered Dietitian Monica Reinagel says it may take several pounds of fruits and vegetables to produce an 8-ounce cup of juice, which is why juice is considered a concentrated source of calories. The calories in a glass of juice varies, depending on the vegetable and fruit you're juicing. An 8-ounce glass of carrot juice has 176 calories and 20 grams of sugar, while the same serving of cucumber juice has 96 calories and 8 grams of sugar. Apple juice has 240 calories and 48 grams of sugar per 8 ounces, while mango juice has 288 calories and 64 grams of sugar. While you may want the calories from juice to help with your weight gain, you may not want all the sugar. Drinking 500 calories worth of an apple and carrot juice combo may contain more than 70 grams of sugar, which is equivalent to consuming 17 teaspoons of table sugar. Getting a heavy dose of sugar in a drink can cause a spike in your blood sugar, which may be concerning for people who need to control blood sugar such as those with diabetes. Fresh juice is also not a good source of protein, fat, vitamin D, calcium or iron, and may not provide the balanced nutrition you need when it comes to healthy weight gain. You may be able to limit the effects of your juice on blood sugar by adding some of the pulp back to help slow the rate of digestion so the sugar isn't absorbed as quickly. You may also consider limiting your fresh juice intake to no more than 8 ounces a day, and getting the rest of your weight-gain calories from other high-calorie, nutrient-rich foods such as nuts, seeds, eggs, cheese or vegetable oils. For a more balanced approach, consider using your fresh juice in a smoothie. Blend 1 cup of soy milk with 1/2 cup of fresh kale juice, a medium banana, 1 cup of blueberries and 1 tablespoon of almond butter for a smoothie that has 558 calories and 45 grams of sugar. It also contains about 13 grams of protein and 13 grams of fat. Drinking a 500-calorie smoothie each day in addition to your regular dietary intake could help you gain 1 pound per week. For variety in your fruit juice smoothies, use different kinds of juices, fruits, nut butters, milks and Greek yogurt. To prevent food-borne illness with juicing, it's important to follow certain precautions before you start the extracting. First, you want to juice fresh produce that's free of mold and soft spots. Also, before cutting or juicing, rinse your fruits and veggies under cold water to remove dirt and other contaminants. Juice only the amount you can drink in 48 hours. Refrigerate your leftovers in a covered container, and discard after two days. QuickandDirtyTips.com: Juicing: Healthy Habit or Sugar Bomb?